From responsive websites to web apps, iostudio creates tailored digital experiences to directly answer the needs of your customer, whether that means a complex military skills translator for veterans or a simple, yet comprehensive, online hub for parents. We leverage our subject matter expertise—in technology, content and user experience—to develop the most impactful solution for your business. UI/UX design is so new that most companies are still trying to figure out the difference between the two. Fortunately for you, we're not most companies. Businesses are living and dying on the web. Does your website need a digital lifeline? Phone a friend. You can reach us at 615.256.6282. Content isn't just the backbone of a website or application: it is the website or application. We take time to learn about our clients, so we can craft content to match their brand aesthetic, detail-for-detail. Today, the mouse is mightier than the sword. Consider HTML the new paintbrush and <> the new acrylic. Our coders are valiant painters who artfully capture your brand identity and battle boring user experience. Data is beautiful, but usable data is even more satisfying—like the wry smile of a Mona Lisa. We make Mona Lisas regularly for our clients. If you're not one already—a client, that is—you should be. OK. We know it's weird that we love this stuff. It's just our thing. And we're OK with that. The State of Tennessee offers thousands of services that benefit Tennessee families. Unfortunately, overlapping messaging across six State departments and disjointed branding left Tennessee families either unaware of the services or confused on how to access them. We began with a deep dive into both the audience and the client to pinpoint opportunities for greater efficiency in State outreach. Through focus groups and surveys with the audience, we identified their media habits and interests. Through discovery sessions with the client, we grouped the services into simple categories of health, education, development and support. 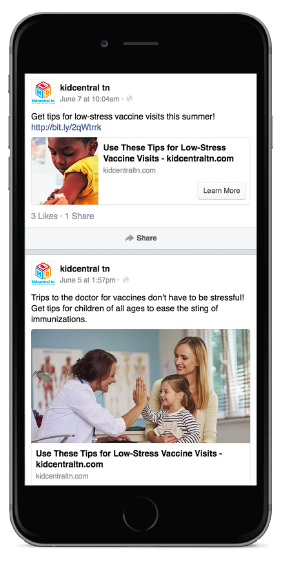 Marrying the audience and client research, we created kidcentral tn, a branded cross-channel platform including a responsive website with a robust content management system, social media and email marketing. The platform content is ensured to be enriching and actionable, motivating the audience to learn more about State services. As a result, unique website visitors trend greater than 140 percent of State goals—with traffic conversions to State services trending greater than 170 percent of State goals. The U.S. Chamber of Commerce Hiring Our Heroes program sought to combat the increasing unemployment rate of military veterans. The Chamber identified the tremendous gap in communication and understanding between civilian hiring managers and veterans, but it lacked a platform to bring the two audiences together. Within the first month of launch, the veteran resume app, Resume Engine, received more than 30,000 unique visitors. With a suite of digital tools, we empowered both audiences to connect. We equipped the hiring managers with a content marketing site with more than 30 original articles on hiring and retaining veterans, as well as a virtual job fair site to connect in real time. To prepare veterans, we created a web application to translate their military experience into civilian career skills—culminating in a single-page resume. Understanding that military spouses face similar challenges, we created an app customized to the military spouse experience. Additionally, we created a series of sites to inform veterans on civilian industry and state-funded military support across the nation, as well as 24/7-access to the virtual job fair. The Army National Guard is required to annually maintain more than 300,000 soldiers, which requires a digitally-based recruitment platform to attract, inform and process hundreds of thousands of recruitment leads per year. NationalGuard.com: The online hub for the Guard, which transforms visitors into educated recruitment leads through tools such as web applications, over 40 videos, and more than 40 microsites for states and territories. Contact Prequalification Processing System: The customer relationship management software, housed in a .mil environment, used by contact center operators to track each inquiry, then process and securely transmit data. Campaign Management Portal: The application tracking and measuring every advertising and marketing campaign and program. The Portal tracks first contact through to enlistment to reveal return on investment.